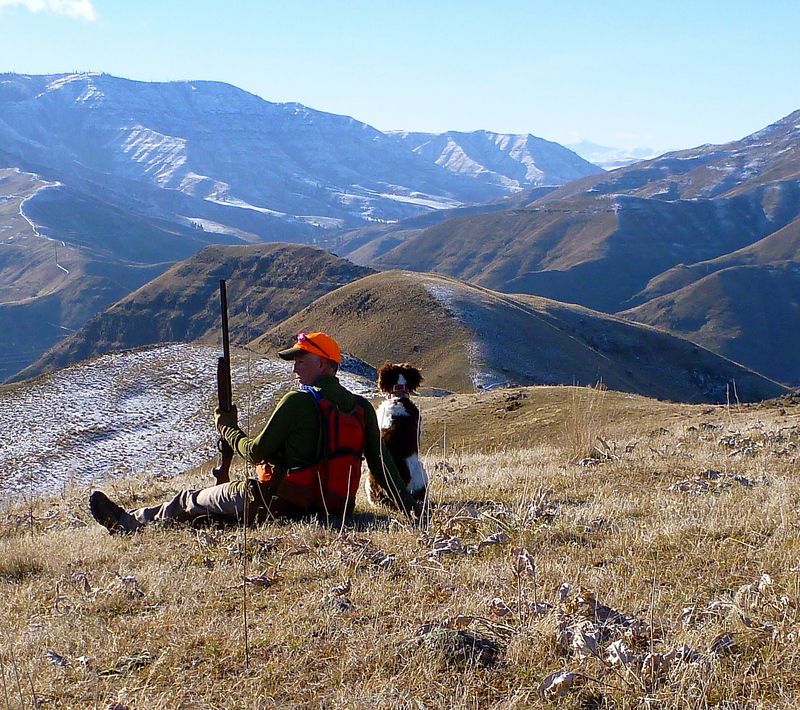 Last Saturday’s hunt brought clarity to me on the real reason why I enjoy chukar hunting. 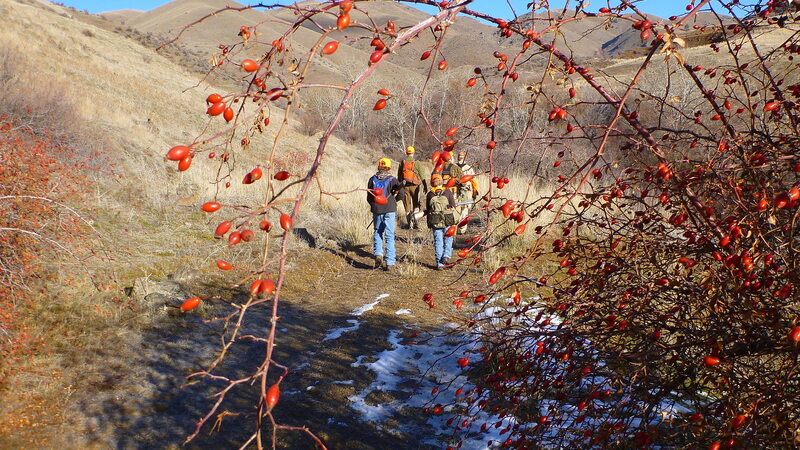 I was a bit under the weather but didn’t want to miss a chance to go down into Hell’s Canyon with Bob and our visiting friend Greg and his dog Ava. We picked up “the kid” and his older brother along the way. 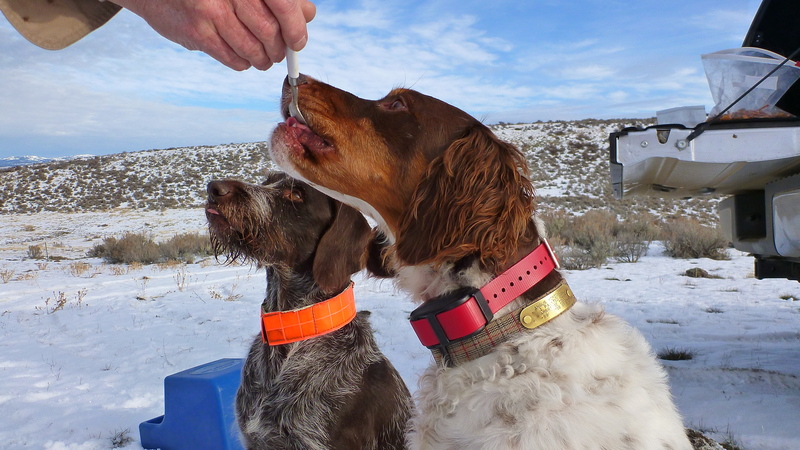 It was the older brother’s first time chukar hunting. We also met our other friend Sam and his dog Hannah down at the bottom of the canyon at the designated meeting place. We set out walking slowly together on a gradual uphill road for about a mile before splitting up into three groups heading into different directions. 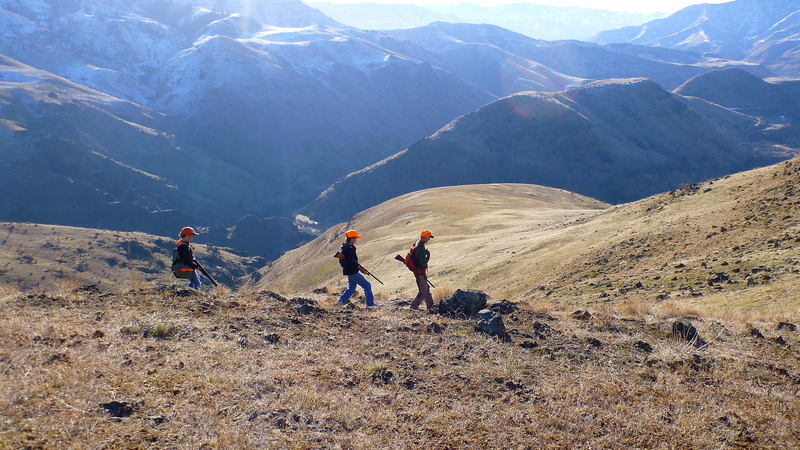 It’s big country down there in the canyon; you can hunt for hours before running into your hunting partner or partners. Our group of four and Angus headed uphill. We went up and down, the kid and his older brother following Bob closely. Angus, nose to the ground, was having a hard time pin-pointing the bird scent in the changing winds at the top. 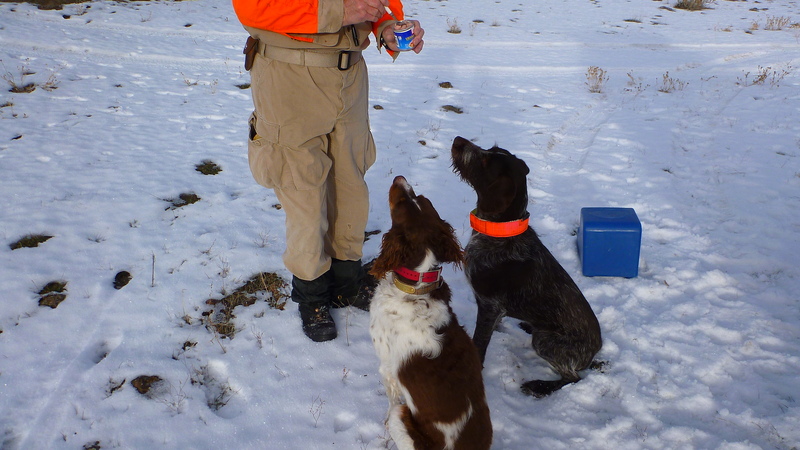 Angus did manage to point a couple of coveys, but the shooters missed after busting them. You never know where they’ll come up. “Pointing” is a relative term. We chased Angus around, back and forth, and then back again like he was leading a parade. Tired at the top, we found a couple of nice spots blocked from the wind to take a break. This is where the clarity part comes in. 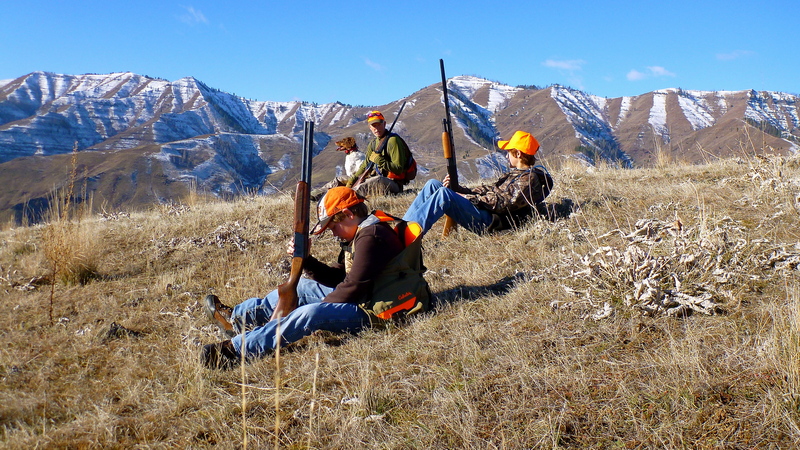 Admiring the view from the top, spending time with super nice people, recounting all our own hunting experiences afterwards, and sharing some good laughs watching Sam feed the dogs vienna sausage with a spoon to thank them for a good hunt. That’s what it’s all about. Really nice pictures that are so clear. You caught the moment.I mean your better half caught the moment as I assume she took the pictures.I really like the one of you and Angus sitting at the top of the mountain. Thanks for posting and good luck. Alan, you’re so kind to comment. Leslie took the pics and wrote the post, too. I’m one lucky dude. How’s the weather in AK? My hunting partner of the last 30yrs died of a heart attack this past weekend. He was 80 and on a hunt trip when he was called to his maker. It don’t get any better than that, but I will sure will miss him. Thanks for the comment, John. I can only imagine the void you’ll feel hunting without your buddy. I’m sorry for your loss and wish you the best. Gorgeous photos. Been a dry year regarding snow in the west. I was struck by the impression of fatigue in the body language of one of the “kids” taking a break at the top. Took me back to when I was just a kid trying to keep up with Dad while lugging around this really heavy shotgun. And that was the flatlands of Michigan, not Chukar country!! 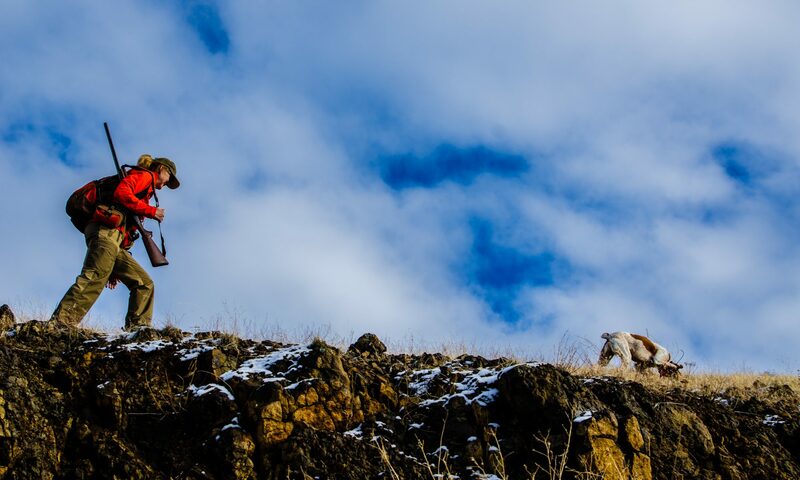 I was blessed to have my 18 yr old follow me around chasing Chukar in WA last week and I love to see your images of the kids working their tails off to be in the hunt. Thanks, Jim. My wife has become a good documentary photographer through this activity. The Kid was beat that day; later his mom told me he’d been sick but didn’t want to pass up the hunt. And his gun, unloaded, is heavier than mine when it’s full. Any luck in Washington last week? We flushed one way down low (while the gun was still slung) and the only other birds were a small covey on the back side of the ridge. Unfortunately I saw them sail by at 40 yds just as I was wondering where Cutter (my Brit) was. I can only speculate, maybe he came in on them from the upwind side and bumped them? I’ve seen him wind birds at 40 yds and lock up and I’ve watched him lock up on birds that were less than a foot from his nose. Those are fun flushing situations!! If it wasn’t a minimum two hour drive, we’d be out a lot more often! Now that’s a good day bud. Congrats, you’ve earned it! Next PostNext What is this?